Hatoful Boyfriend – It’s gone gold and Angie is back! Hatoful Boyfriend, the bizarre game of pigeon dating in a (nearly) post-human world has gone gold and the masochistic Angie Gallant is writing another Let’s Play on this strange creation with the terrifying FAT BIRD. Hatoful Boyfriend – psychotic pigeon dating game! Ever been interested in dating games? How about dating games featuring pigeons? How about dating games featuring pigeons and a homicidal fat bird? 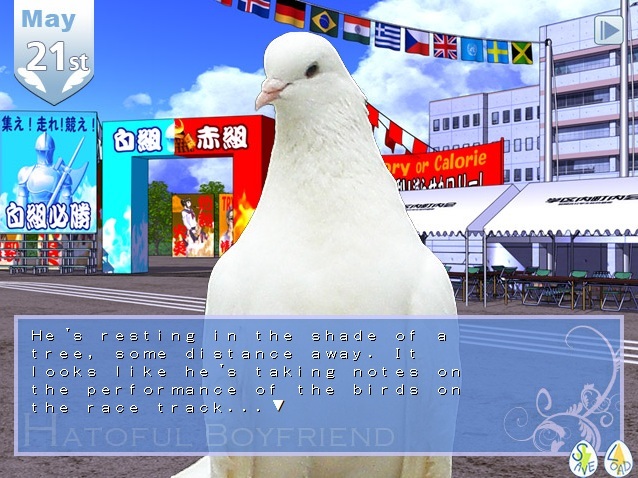 Regardless of your answer you should be, because Angie Gallant’s AAR of pigeon dating game Hatoful Boyfriend is quite possibly the best AAR of 2011. Seriously, go read this AAR right now. It’s funny as hell and yes, there really is a dating game about pigeons. Of course, it’s from Japan, which might explain some of the other very strange features I won’t spoil for you!